Christopher North and Jim Dening explore people, landscapes and ideas in reading from their recent work. Chris’s poems report surprising, sometimes serious, sometimes hilarious, events and encounters. Jim looks for meanings, echoes and ghosts in his narratives. Both poets love the force of words and the power of poetry to open new windows on the real and the unreal. Chris North lives in Spain and has published five collections. 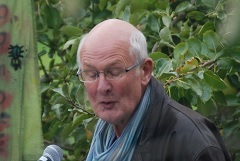 Jim Dening has lived in France, now lives in Ledbury; he has two volumes of poetry out and a third in preparation.